There’s no question that the New York Public Library is a beautiful and serene place to catch up on your reading. But who wants to be indoors when the birds are chirping, the sun is shining, and a lovely spring breeze is in the air? 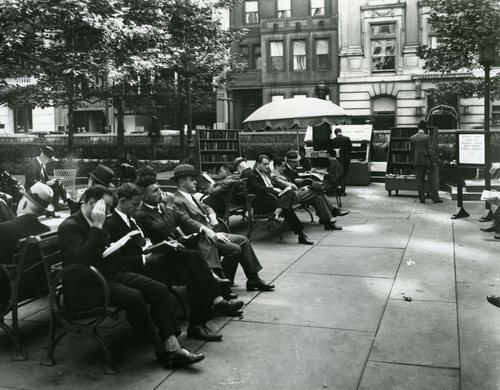 The Bryant Park Reading Room is a wonderful outdoor location to read, write, and attend literary events, right in the Library’s backyard. Our Reading Room is modeled on the original amenity that was created during the Depression Era in 1935. It was a place for people without jobs, money, a library card, or even a valid address or ID to spend time during the day and enjoy reading materials at no cost. The original amenity closed in 1944 due to an increase in jobs and World War II. 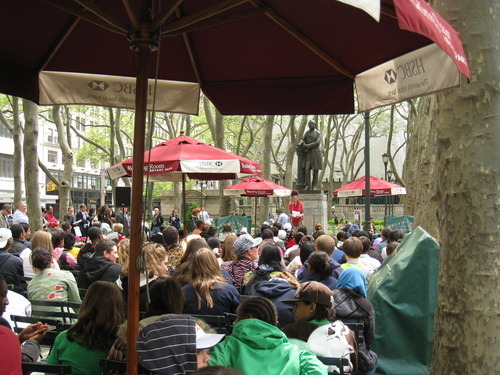 In 2003, Bryant Park Corporation decided to revive and reinvent the idea, adding custom book carts, children’s books and furniture, umbrellas, and literary programming to the space. This week, the Reading Room will reopen for the 2010 season. In addition to the Word for Word series of readings, workshops, and kids events (curated by Paul Romero and his team), the Reading Room offers free use of 14 newspapers delivered daily from Mitchell’s Newspaper Delivery Service, 30 magazines from Conde Nast, Time, Inc., Hachette Filipacchi, and Rodale, and over 1,500 books for adults and children, donated from various sources including Oxford University Press and Scholastic, Inc. The Reading Room is located mid-block on the 42nd Street side of Bryant Park. Look for the burgundy and white umbrellas that define the space and pay tribute to HSBC North America, our generous partner since opening day in 2003.